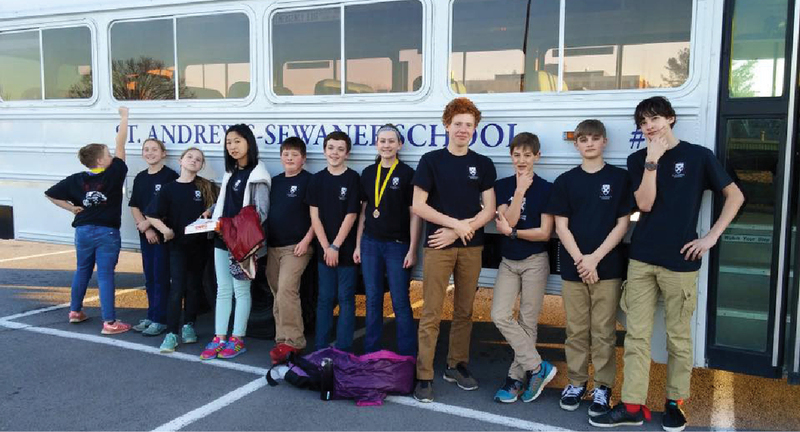 St. Andrew's-Sewanee School's Science Olympiad team went to Murfreesboro for the regional competition on February 27. Under the coaching of teachers Luke Diamond and Liz Quinn-Stine, the team brought home three medals. Emma Diamond '20 and Aidan Smith '20 placed fifth in Bottle Rocket. Nickel Carlson '20 and Emma placed fifth in Dynamic Planet. Maddy Mendlewski '22 and Madeline Mundkowsky '22 placed fourth in Fossils. Other students competing for the Science Olympiad team included Riley Burnette '22, Sophia Carlos '22, Vivian Li '19, Colin DeLorme '22, Gus Croom '22, Evan Fox '20, and Bo Sain '20. Overall, the team placed 11th out of 15 teams in the regional competition. Metereology - We did not compete.